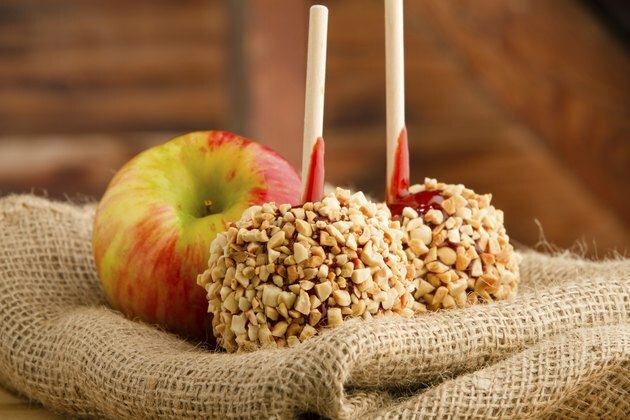 Caramel apples are good any time of year, but they evoke a sense of autumn, when the crunch of leaves and the scent of apples fill the air. The apples provide a healthy substrate for the caramel so you get a bit of nutrition with your chewy treat. Depending on their size, apples have anywhere from 77 to 120 calories. Along with calories, apples provide 2 to 4 grams of fiber, calcium, vitamin C, vitamin K, vitamin A, potassium, magnesium and other minerals, vitamins and phytonutrients. Your treat is off to a healthy start. Though the size of the apple and the thickness of caramel can vary, caramel coating usually amounts to the equivalent of three or four caramel candies. This adds 120 to 160 calories to your caramel apple adventure. A simple caramel apple has 200 to 280 calories, about the same as a candy bar. If you want 2 tablespoons of crushed nuts on your caramel apple, you add an additional 110 calories. The nuts have calories, but they are nutrient dense, adding protein, vitamin E, folate, fiber and magnesium as well. With nuts, your treat has all three macronutrients -- protein, carbohydrates and fat -- but it could run as high as 390 calories.